The Harkreader family lived near Moundville and also near Bronaugh. Some moved to Peru, Kansas. It seems that the name was sometimes spelled Harkrader. 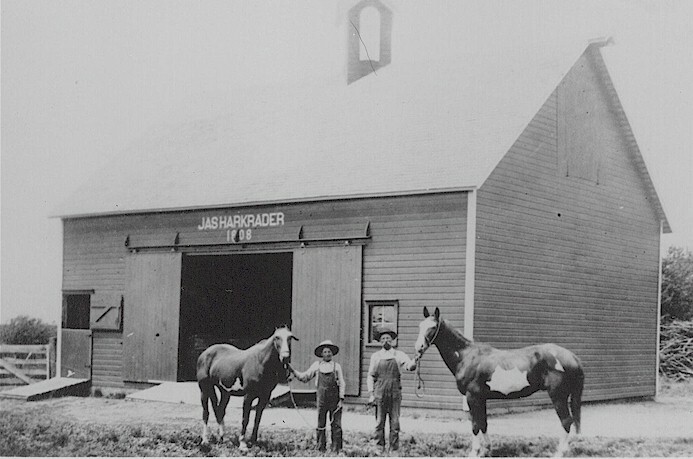 Thanks to Lindell Haverstic for sharing this photo of the nice James Harkrader barn 1908. 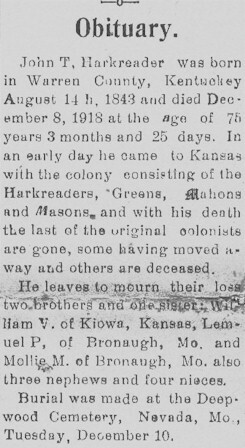 The family moved to Kansas where Thomas died October 19, 1887. He was buried at Peru Cemetery, Peru, Chautauqua County, Kansas. His grave marker is shown on Find A Grave. His widow's obituary is shown below. Here are two Harkreader Obituaries that appeared in the Bronaugh Journal. The Mary Knox Harkreader obituary appeared July 5, 1922. It shows that she was the mother of Clarissa Butterfield of Moundville and therefore the grandmother of Mrs. Cleora Ashbaugh and her brothers Charley and J. E. It also shows that she was buried at Peru, Kansas. The photo above is from the Ashbaugh collection. Hazel Harkreader of Peru, Kansas sent it to Moundville. These must be Harkreader girls. 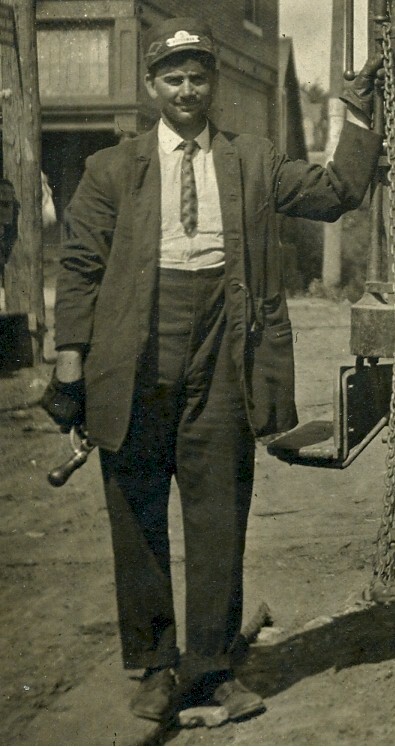 John T. Harkreader was Vernon County Sheriff from 1900 - 1904. This photo is from a Nevada newspaper article. The obituary is from the December 11, 1918 Bronaugh Journal. This grave marker in the old Moundville Cemetery is for James T. Harkrader and his wife Minnie Pointer Harkrader. Minnie's obituary from the August 20, 1906, Nevada Daily Mail is shown to the left. James T. is listed in the census records above as the son of Thomas J. Mary Etta Harkrader. Thats also his barn at the top of the page. 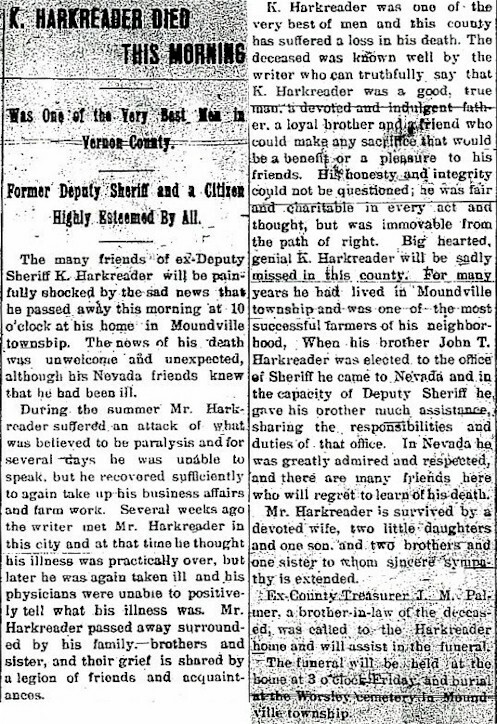 Bill Miller wrote that John T. Harkreader of the obituary was his Great Great Uncle. 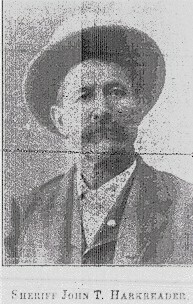 John's brother Lemuel Porter Harkreader (mentioned in the obit) is Bill's Great Grandfather on his mother's side. Bill tells that he can "trace the Harkreader family back to the arrivial of Johannes Herrgeroder (aka John Hargrader) who came to America in 1733. He had 13 children who spread south and westward from Maryland. The families used the names Harkreader, Harkrader and Harkrider with a few other odd spellings (in Lousiana). My side settled in Tennessee then moved northward to Kentucky then on to Missouri and Kansas (Kiowa)." The obituary to the left is for K. Harkreader who is buried in Worsley Cemetery. his dates are June 18, 1861 - November 14, 1907. His wife is buried beside him. 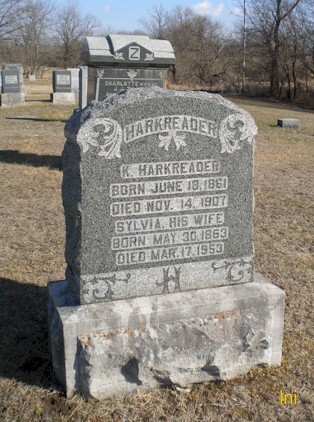 The dates for Sylvia Harkreader are May 30, 1863 - March 17, 1953. 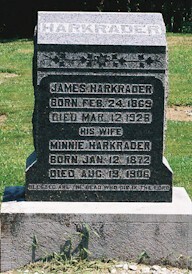 Pauline wrote that James Thomas "Jim" Harkrader was the son of Thomas Jefferson Harkrader and his second wife Mary Ellen Knox (see obituary above). They also had Clarissa Ellen and Edward "Edd" Pauline's line stems from Thomas J. 's first marriage to Elizabeth Simpson---their children were John Wilbern, Anna Belle, Ada May and Grandville Ryan "Grant". John Wilbern was her Grandfather. 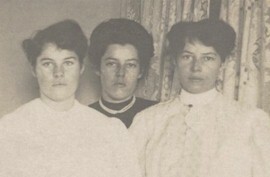 The Hazel who sent the snap shot above is pictured with her six sisters. She is the one to the right and it appears that two of them are in the photo at the top of the page. 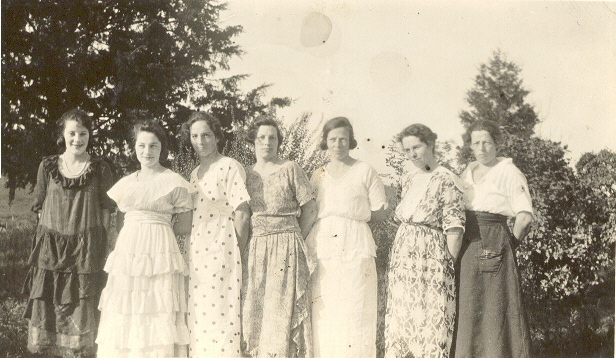 These seven girls are the daughters of John & Clara Harkrader. Gurtha is the second from the left. The ad to the left appeared in the 1918 Bronaugh Journal. Arcadia is just across the state line southwest of Bronaugh (10 miles or so). This obituary from the March 9, 1927 Bronaugh Journal is for L. P. Harkreader. It tells that he had married Amy Downs on December 16, 1885 and they had two children, Frank and Hallie. He was buried at Deepwood Cemetery in Nevada. Thanks to Kathy Titus Snyder for sharing this great image that came from the Dicy Noel estate. The identification says "Frank Harkreader). That is written on the back side approximately where one of the men is on the other side. So I am assuming that the man on the left is Frank Harkreader. 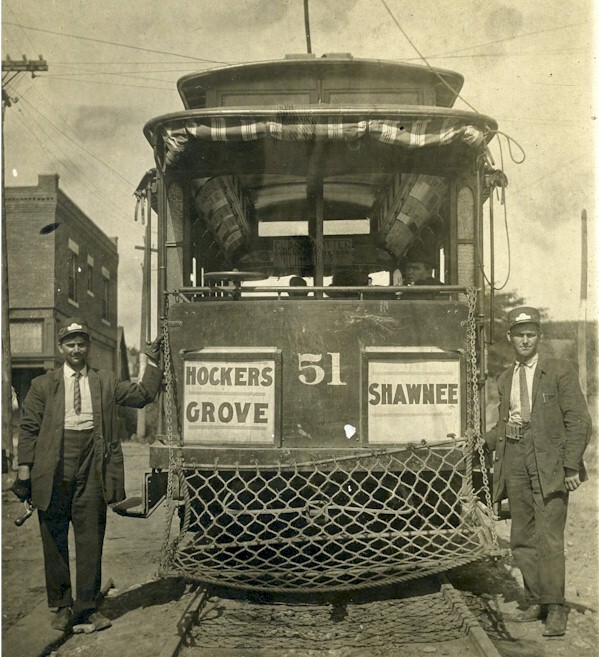 Hocker Grove was near what became Shawnee Mission, Kansas (near Kansas City). Frank Harkreader was the son of Lemuel P. and Amy Harkreader and he grew up in Vernon County. He enlisted in the army in Colorado in 1910 and served until 1913. His occupation was listed as Conductor, which is consistent with this image. Franks married Carrie Goff and they raised one daughter. After a few years, they moved to Calfornia. Frank died in Riverside, California in 1962.